By Getting in My Rhyme Book!!! Before there was Drake, there was Aubrey Graham — who was hard at work putting pen to paper before he ever blew up as a rapper … and now you can buy his old flows for tens of thousands. A notebook owned by Drizzy between 2002 and 2005 is going up for sale through the memorabilia company Moments in Time — and they’re hawking this treasure for a hefty price tag of $32,500. The notebook was found in a dumpster near Drake’s grandpa’s old furniture factory in Toronto, where Drake used to work. It also features his signature, so this thing’s legit. The price might sound steep, but trust us … there’s good content in here that’s worth every penny. 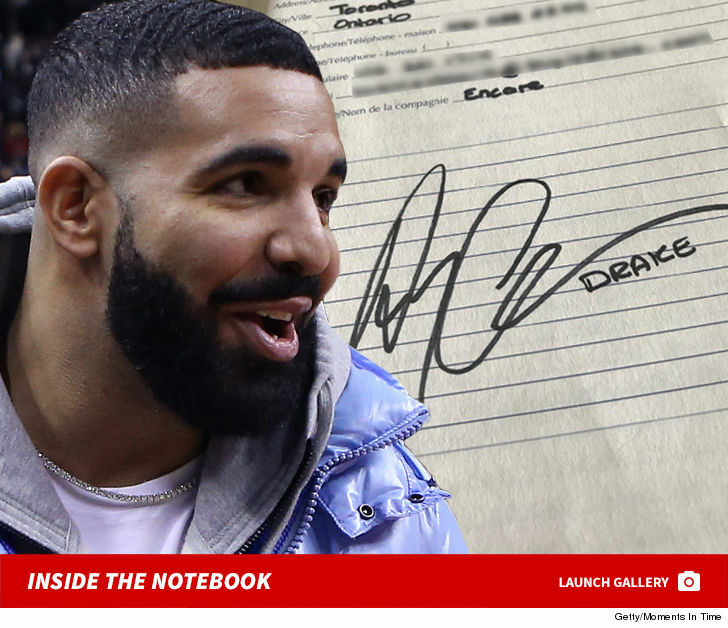 We’re told this particular notebook features 20-25 pages of verses, full songs, and random musings by the hip-hop legend during his ‘Degrassi’ days. Check it out … it doesn’t sound like a whole lot has changed in the ladies department. But, he’s definitely gotten better at rhyming. That much is for sure.